It's often said that there's something out there for everyone, and I knew from the moment I saw some of the preview pages from The Carter Family: Don't Forget This Song that it would be absolute catnip for me. Frank M. Young and David Lasky, with the help of 150 or so Kickstarter backers, have pulled off something very special. It also happens to be a perfect constellation of my interests: comics, sadness, biography and folk music, set against the somewhat dour backdrop of rural early 20th century America. Very brief history lesson: country music as it exists today grew out of the tradition of Woody Guthrie, Bob Dylan (before he went weird), Johnny Cash and countless others of that generation and style. And pretty much all of those guys and their contemporaries were heavily influenced by the Carter Family. A.P. Carter, his wife Sara and her cousin Maybelle (mother of June Carter Cash) played music together as the Carter Family from the early 1920s to the mid 1950s, had a crowd of musically talented children between them, revived interest in hundreds of traditional songs from their native Virginia and set the stage for basically all the American country music that followed. Not bad going. I'd tell you more, but the whole story is in the book and you should definitely read it. 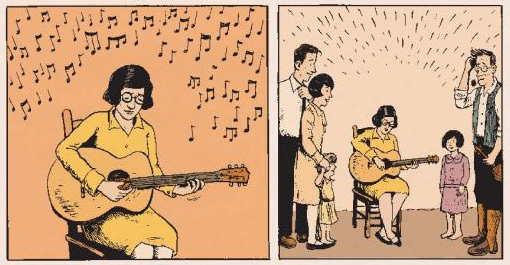 I'm approaching The Carter Family with my interest-in-sadness-and-comics rather than my interest-in-folk-music hat on, but it wouldn't be possible to review a book with so much music woven through it without spending a minute or two talking about that. As an absolutely brilliant bonus, the book comes with a CD of original Carter Family recordings. I can almost guarantee that I'm going to be listening to nothing else for the next couple of weeks. Music in The Carter Family is represented straightforwardly using words and pictures, but it's done really rather well – the feeling of having lost something by not being able to travel back through time and sit silently in the living room, recording studio or radio booth with the Carters while they sing and play is intense and palpable, but Young and Lasky's writing and art nearly makes up for the fact that no one's figured out time travel yet. I ached, as I read it, to hear the songs. The depiction of A.P. Carter and Sara Dougherty's harmony – the moment in their courtship when all her other suitors admit defeat, the couple's voices blending together in a red cloud above their heads – is one of the most perfect visual interpretations of sound that I've ever seen, and it's this skilful representation which makes something so thoroughly grounded in sound actually work on the page. However, if you know or care little about music (of this period & genre or in general), there's still plenty to like about The Carter Family. As with all the best (true) stories, the narrative is strong and deeply human, infused with a lingering sadness as the Carters achieve musical and financial success but find that they're less happy than they were when they were poorer. The story can be a little jarring as it jumps forward in time, but it's a powerful enough tale that this doesn't really matter. The Carters are, at heart, good people who end up out of their depth. By the end of the book, it's still about the music, but everything else around them has changed. And in terms of the art, Lasky's linework and muted colour palette suits the Depression-era setting perfectly. The Carter Family: Don't Forget This Song was a joy to read, and you've a real treat in store for you if you haven't picked it up yet.